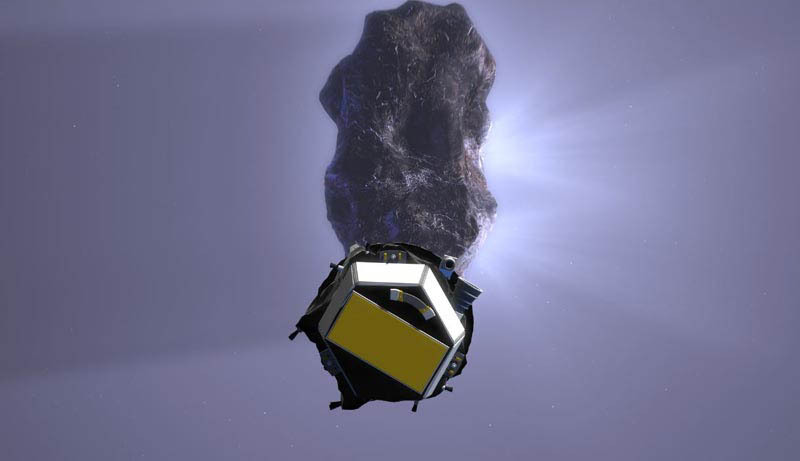 The graphic above depicts Deep Impact approaching Comet Tempel 1. Impact should occur at 10:52 p.m. PDT on July 3rd. Part of the spacecraft will impact the comet at a speed of 23,000 miles per hour. The other part of the spacecraft, the Flyby segment, will pass 310 miles below. It has about 13 minutes to take images before it hits a deluge of particles from the comet. As of June 15, the high resolution camera is having trouble obtaining a good focus but engineers at JPL think they can rectify that problem with image processing software. The impact will be televised on NASA-TV and may include images from the spacecraft if the cameras are in good working order. The comet will be close to magnitude 9 before impact and could change (temporarily) to magnitude 6 as a result of the impact. Photo courtesy of NASA/JPL-Caltech. 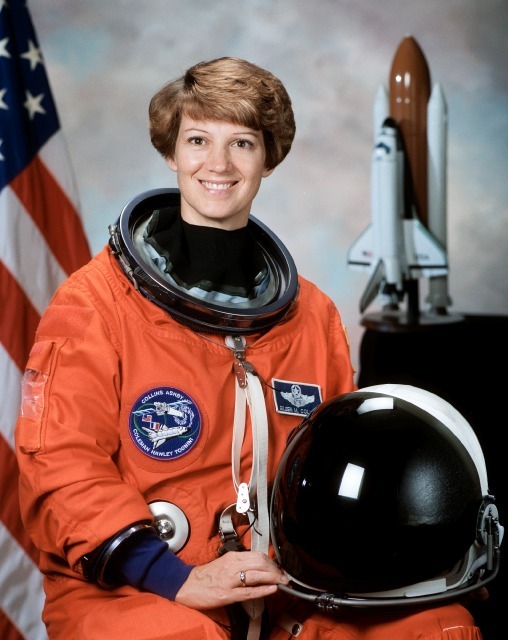 Second picture: Eileen Collins will be the commander on the space shuttle's Return to Flight mission which is set to launch no earlier than July 13. The new fuel tank has been mated to Discovery and is back on the pad. Commander Collins was the first woman shuttle commander in 1999 when the Chandra X-Ray Observatory was deployed on STS-93 (Columbia). She also was part of the crew on STS-84 (Atlantis) which was the sixth mission to rendezvous and dock with the Russian Space Station Mir. It has been 2 and half years since the Columbia tragedy. The next flight after Discovery will be Atlantis and that is scheduled for no earlier than September 9. Photo courtesy of NASA. The beginning of July is a good month for watching planets near stars and star clusters. On the nights of July 2 and 3, both Mercury and Venus will pass less than a degree from the Beehive cluster (M44), making for a lovely evening twilight view in a telescope of nearly any size, or in binoculars. Obviously, this means Mercury and Venus are very close to each other throughout the early part of July: their conjunction will be on the night of the 6th, with about a degree and a half of separation between the two. Mercury is visible in the early evening sky at the beginning of the month, showing a half phase, but it rapidly closes with the sun and dwindles to a crescent, becoming lost in the sun's glare by the middle of the month. Venus, too, is low in the west during evening twilight, setting about an hour and a half after sunset, changing phase from nearly full at the beginning of July to gibbous by month's end. Early risers get a good morning show, too. On the morning of July 2, the slim crescent moon, only a few days from new, will skim just south of the Pleiades. Then on the evening of the 29th, a slightly fuller moon, just past third quarter, loops back around for another pass by the Pleiades, this time coming just over half a degree from the cluster. Mars is still an object for morning observers; it rises a bit after midnight but doesn't get very high until morning twilight. Saturn is lost in the sun's glare this month. Jupiter, of course, rules the roost. It's already high in the sky when night falls. Sometimes the best seeing on summer evenings is right at dusk before the sky gets fully dark, and Jupiter is so bright that it's a perfect target. Set up a scope around sunset and let it cool off while the sky darkens enough to find Jupiter-then enjoy! Try to hunt down those faint details in the bands, and look for turbulence around the great pink spot. And, of course, watch Jupiter's Galilean moons! Neptune rises around the time the sky gets dark, with Uranus following about an hour later. They should be found fairly easily starting around midnight (for a challenge, try them earlier). There's one more addition to this month's dance of planets and stars. On the evening of the 17th, the moon will pass in front of Antares, starting at 8:08 pm; the star should reappear at 9:00. This is the first bright star occultation we've had in a while, and should be fun to watch. The moon will be nearly full, otherwise I'd suggest checking whether you can see the low surface brightness globular cluster M4 near Antares. What the heck: try anyway! The moon will actually skirt the edge of M4 earlier in the evening, around 6 pm, but even if the moon's brightness didn't wash out dim M4, the sky won't be dark enough yet to see the cluster.